Sample Sale Alert: Tocca Spring Sample Sale | Fashion. Style. Beauty. | Life is short. Live well. It’s that time of year because sample sale invitations are coming left and right! 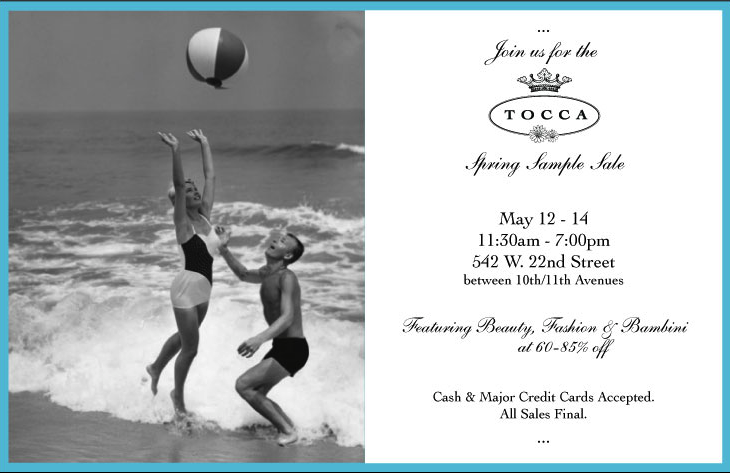 Here’s a sample sale invite for Tocca, one of my personal favorites. Mark your calendars for May 12th – 14th from 11:30 am – 7:00 pm, where you can expect 60-85% off their beauty, fashion (the dresses, people – the dresses), and Bambini collections. Details are in the invite above but if you need the address again, it’s 542 W. 22nd Street b/t 10th and 11th Avenues. See you there!